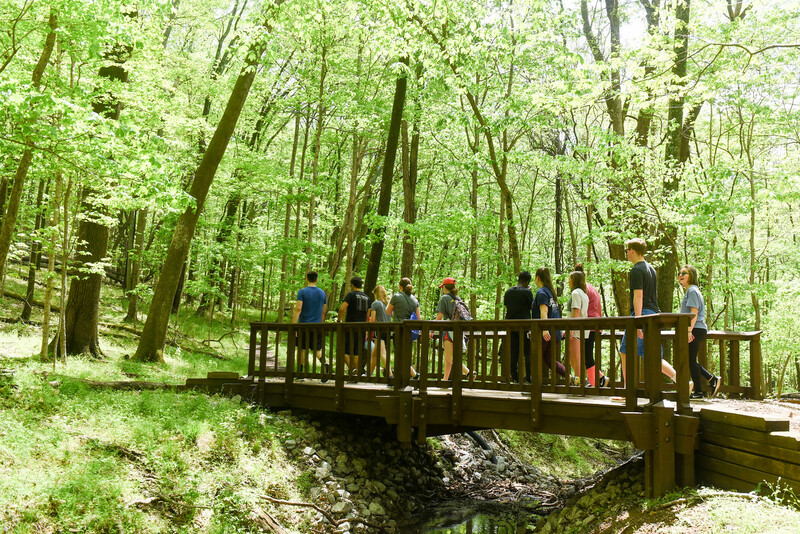 On Wednesday, April 19, first-year students enrolled in Dr. Bonnie Smith Whitehouse’s “Writers Who Walk” and Holly Huddleston’s “Health and Fitness Concepts” courses traveled to Radnor Lake State Park with their guided journals in hand to experience how exercise and nature foster creative writing. The group walked the three-mile-long trail together while making stops along the way to sit in the solitude of nature and write their thoughts. This is just one example of an opportunity made possible through Belmont’s interdisciplinary Learning Community Courses (LCC) requirement found in the University’s general education program, better known on campus as the BELL Core. LCCs, which link together two courses from different areas of study that share a common issue or goal, support the idea that integrating lessons between classes is a critical part of the learning process. The primary purpose of the LCC is to build on the understanding of “ways of knowing,” developed in Belmont’s First-Year Seminar (FYS) program. The experience of “crossing borders,” which is central to the FYS, is a regular practice in an LCC as students cross the borders between two disciplines by completing common assignments, readings and projects. Additionally, exercising the mind while also taking care of the body prepares students to develop a lifelong commitment to wellness in the physical, mental and spiritual sense. Instead of just focusing her lessons on exercise, Huddleston, who teaches in the Sport Science department, is able to show students the true impact exercise can have on all aspects of their lives, beyond just physical health. Throughout the semester, Huddleston and Smith Whitehouse’s students have researched the relationship between the mind and body, learned about labyrinths and pilgrimages and have made interactive walking guides for various locations around Nashville, including Beaman Park and Bells Bend. For more information on Belmont’s LCCs and their purpose, click here.